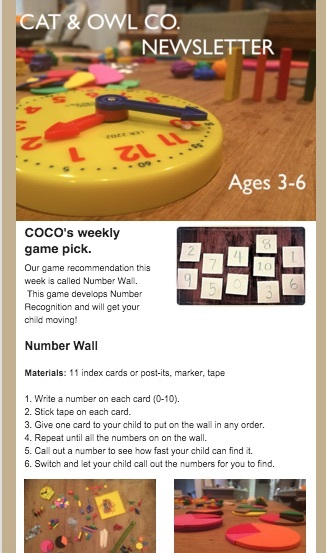 Newsletter — Cat & Owl Co.
Join the COCO Newsletter to receive weekly emails with quick and simple games to develop number concepts and logic with your child. More children? Add their birthdays here. Our team of curriculum designers selects games that will help you dig deeper and spiral. This means that our recommendations become more challenging as your child grows and will rotate through different concepts to give you a broad range to explore. We hope you enjoy these games with your child, and share them with your parent friends!